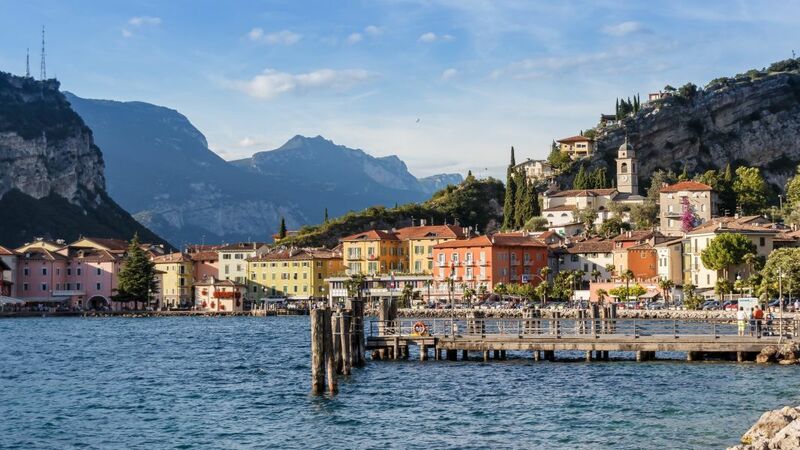 Split between two northern Italian regions, Lombardia to the west and Trentino to the east, Lake Garda has always drawn a large number of visitors to its shores thanks to its consistent weather, beautiful scenery and Italian charm. Lots of families are drawn here thanks to Gardaland, a large theme park located to the south-east of the lake. it offers something for children of all ages from terrifying rollercoasters to rides suitable for younger children and an aquarium. Other attractions include the water park Canevaworld not far from Gardaland, a Jungle adventure park at San Zeno di Montagna on the east of the lake, and the Parco Natura Viva wildlife park at Bussolengo which is also home to a safari park. For those who prefer learning to lounging, Lake Garda has plenty of opportunities. Those interested in the second world war should head to Salò, where Mussolini established the capital of the Italian Social Republic in 1943 until its collapse on 25th April 1945; visit MuSa (the Museum of Salò) to find out more. Other points of interest include the Vittoriale, built in the fascist era by Gabriele d’Annunzio, and the Grotte di Catullo, the remains of a Roman villa built around 2,000 years ago near Sirmione. Popular excursions around Lake Garda include the town of Sirmione on a promontory of the southern shore, and its islands, especially Isola del Garda and the imposing Villa Borghese Cavazza situated there - as a private island it is only accessible as part of a guided tour. If you are staying for a few days you might like to venture further afield to the captivating city of Verona. A visit to Italy isn’t complete without trying the local specialities. Thanks to its mild climate there are a number of lemon and olive groves around the lake as well as numerous vineyards. You can head to a lemon grove, or to a local winery for a wine tasting, easily organised by your hotel, or check out our short wine tasting break. Lake Garda has lots to offer those who prefer to stay active on holiday. In the north thanks to the stronger winds you can try your hand at windsurfing and kitesurfing, while the calmer conditions to the south offer great opportunities for stand up paddleboarding. Adrenaline junkies can head to one of the many canyoning sites around the middle of the lake, there are routes for all levels, from beginners (even children) to those with more experience. Our multi-activity holiday on Lake Garda includes a stand up paddleboarding lesson and a canyoning excursion. Tourists can enjoy pedalling along a number of cycle lanes around the lake, and there are great mountain biking trails towards the north of the lake too. The big news is that by 2021 there will be a cycle lane around the lake’s entire perimeter, so cyclists of all abilities can ride part, or all, of the lake! If you are interested have a look at our short cycling break on Lake Garda. If all this sounds like overkill and all you want to do is flop down on a beach somewhere and reach a good book, then you can do that too! Lake Garda offers a number of pebble beaches along its shores. If that gets to crowded and you’re feeling flush, then hire a boat and head out onto the lake for some peace and quiet. So there you have it, any suggestions for activities that we haven’t mentioned here? Want to know more? Drop us a line today!